Although no one expects to die early, people with dependents to support almost always obtain life insurance policies, to be prepared for the unthinkable. For the same reason, couples with any assets should consider a premarital agreement, because such documents are far more than “divorce insurance.” They allow people to make important financial and other decisions in a calm and collected manner, as opposed to the heat of the moment or when attorneys are charging by the hour. Until recently, only the super-rich bothered with premarital agreements, due to the complex laws. But that was before the Uniform Premarital and Marital Agreements Act took effect in almost all states, including Florida. Now, the laws are not as complex and the results are more predictable. 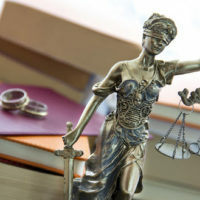 Spousal Support: Although judges may not enforce a complete alimony ban, they will most likely enforce a cap on the amount and a limitation on the duration, especially if the spouse agreeing to the reduction receives something else in return. Property Division: In most cases, premarital agreements may not only divide property according to the agreement of the parties, but also classify property as marital or nonmarital, thus saving considerable time and expense in any future divorce litigation. Inheritance: As a matter of law, stepchildren cannot inherit from non-natural parents, in most cases. To remedy this situation, many stepparents include inheritance provisions in a premarital agreement and simultaneously sign a will or other executory document. No contract may contain any provisions that are against public policy, and so premarital agreements may not cover child custody or child support issues. Involuntary: If Bride approaches Groom six months before the ceremony and says “sign this prenup or the wedding’s off,” the agreement is probably still voluntary despite the Bride’s ultimatum. However, if Bride approaches Groom six hours before the ceremony, when all the plans have been made and paid for, and then says “sign this prenup or the wedding’s off,” the agreement may be involuntary, because Groom was under immense pressure and had no way to seek independent legal counsel. Unconscionable: In the same way that “involuntary” means more than some undue pressure, “unconscionable” means more than uneven. The distribution must be so unfair that it shocks the consciousness. Furthermore, the agreement must have been unconscionable at the time it was made, a situation that arises often when stock options are involved. Blindness: To return to the previous example, for Groom to overturn the agreement on the basis of Bride’s withheld information, Groom must establish both that the missing data was material and that he had no other way to obtain this information. Since most premarital agreements and other contracts contain severability clauses, the court will probably strike the illegal portion and enforce the remainder. Premarital agreements are an important component of many successful marriages. For a free consultation with an experienced family law attorney in Port St. Lucie, contact Eighmie Law Firm, P.A. We routinely handle matters throughout the Treasure Coast vicinity.